These reindeer antlers are perfect for Christmas! They are shaped like traditional reindeer antlers but feature a red and white candy cane print and attached bells and bows. The Christmas reindeer antlers are colored as pictured. 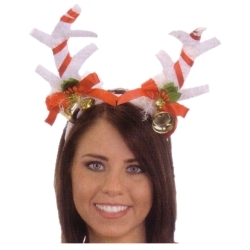 Antlers are one size fits most using a flexible fabric covered headband.